Lately I’ve been collecting and analysing Twitter data. I’ve been looking at networks formed by friends and followers of a set of people, tracking the path of tweets and generally building on my python skills. I’m working toward a pretty ambitious goal but, inspired by the arc diagrams in the NYTWrites project, I decided to take a short break and render out one of my own. 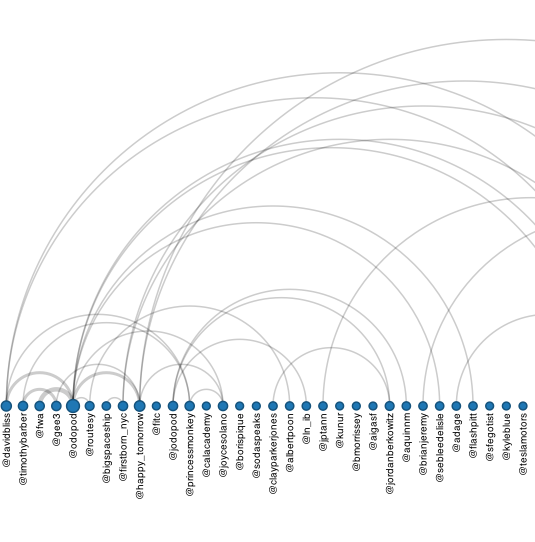 The diagram shows all twitter users mentioned in tweets by @Odopod, sorted by the number of times they have been mentioned. The arcs link nodes that were mentioned in a tweet with other users and the width of the arc indicates the number of links. The size of the nodes represent the number of links a node has associated to it. This entry was posted in projects and tagged data mining, data visualization. Bookmark the permalink.